I know you shouldn't get too excited when you get a delivery, just in case you're disappointed when you open it. That certainly wasn't the case when I received my SWIG hip flask. I removed the outer bubble wrap to find a small light-blue box with a ribbon wrapped around it, it felt and looked like a Christmas present. 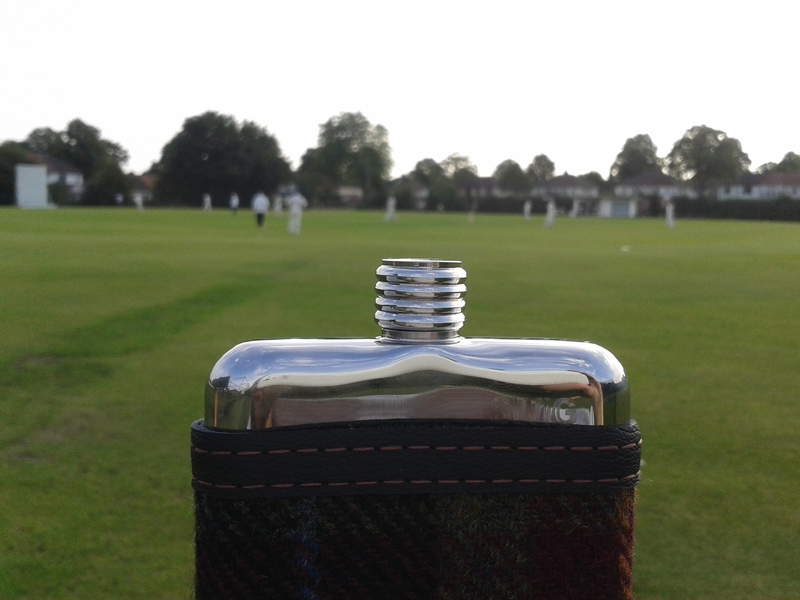 As the writer and editor of thecrickettier.com my main motivation for purchasing a SWIG flask was to take to the cricket with me. Now I know you can't take alcohol or bottles into the major cricket grounds in this country. However I'm a lover of all cricket and quite often head off to some of the more local or smaller grounds around the country, in particular in North West England. Time for my first outing with my new SWIG flask then, now I know you're not meant to have different spirits in there so I was torn between choosing one. I'm not a big whisky drinker at all, but I thought this is one way to sample it more often. Then there was vodka, you know where you're at with that stuff. In the end I went for gin, a refreshing summer drink to have in the sun. 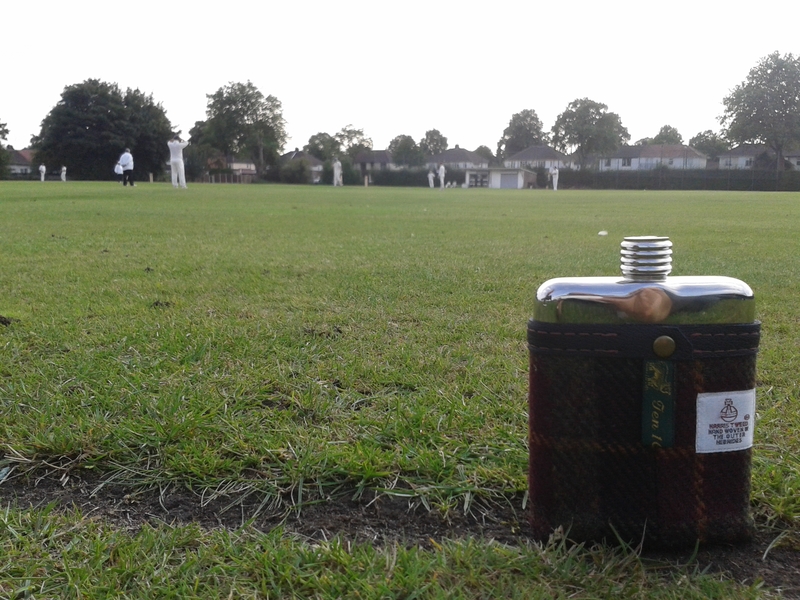 Off I went to my local cricket club on a pleasant sunny Saturday afternoon with my paper, sunglasses and SWIG flask. I purchased a cold pint of lager on arrival at the club, then I took myself off to one of boundary seats and got myself comfy for the afternoon. What a joy it was, my local team won to round off a superb season whilst I enjoyed a chinwag with a few other locals. I'd recommend anyone to purchase a SWIG hip flask, whether you've not used one to regular users of them. As for being a gift for someone, look no further and get one for someone you know. Especially with the variety of pounches you can can choose from as well, I went with a traditional Harris Tweed - Red as you can see. 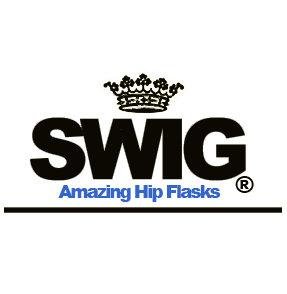 "SWIG is a worldwide luxury hip flask brand. We put a lot of effort into quality of our product, therefore we are happy to give lifetime guarantee. Swig flasks are designed to last for generations. Phone: 020 3239 5864 (+44 (0) 20 3239 5864 for intl)"